Recently marypcb and I got to ride a shiny metal elevator high over the streets of London. We ended up on the 31st floor of the Centrepoint tower, looming over the West End and Oxford Street. The views were spectacular, as the sun slowly set in the west. Looking down we could see the sad remains of the Astoria, one of those rock venues that seemed to be a fixture of the London scene. Until the great hand of the planners came along, and decreed that it was right they wanted to build the entrance to an expanded and refurbished Tottenham Court Road tube station as part of the Crossrail project. 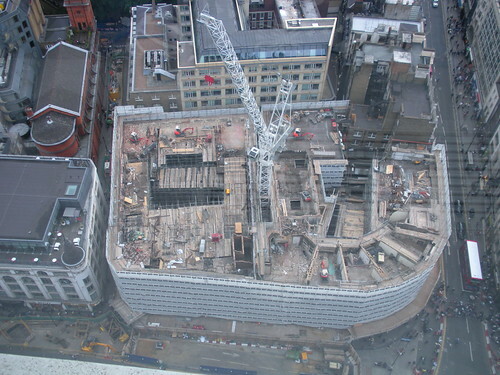 The top floors of the building are gone now, and you can see right down into the theatre - as well as into the hidden atrium that lit the next door office block. The end of an era (or two). Of course the Astoria is not really part of my history, but a 31st floor vantage point over the West End is a treat. Can anyone go up in the Centrepoint tower and loom? It is sad they're tearing it down. But the idea of being that high to look down on it makes me break into a cold sweat.